What if God asked YOU to move to Africa? We are thankful for the people who said, “Yes”. It’s Saturday afternoon and it’s the end of a long week, which is at the end of a long 5 weeks. Like anyone whose been away from home for 4-weeks, there is a LOT of work to catch up on when you return. Ian and I have had a very intense week filled with meetings, decision-making, project follow-up and new project initiation. Those things, coupled with jet-lag and the important role of planning a Memorial service for Shirley Ward (complete with accommodation many Royal and Government VIP’s) has made sitting on our patio to write this blog, a good ending to a good week. While we had a lot to do when we got home, we continue to give thanks to the amazing team of people who keep things running smoothly while we are away. Our Swazi and Kenyan leadership are truly amazing and we are thankful for the extra burden they carry when we are away. None of it is easy, but they all do it with grace and joy. 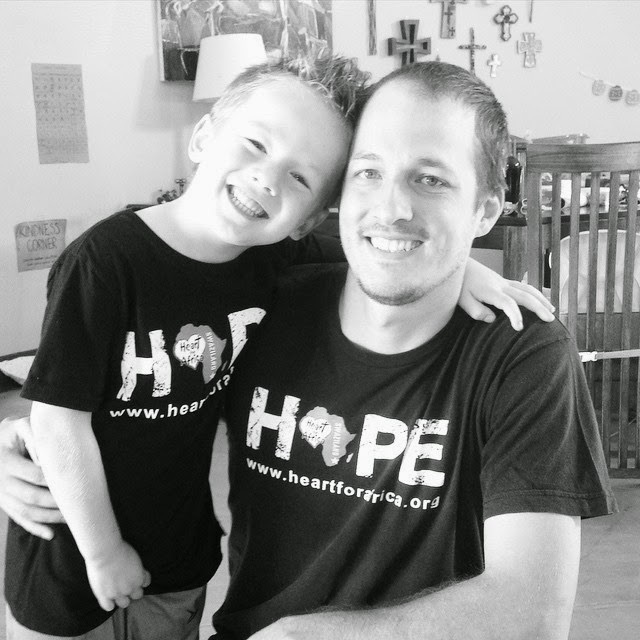 Today I would like to tell you about the other people who help our Swazi’s and Kenyan’s “hold the fort” as we say in North America … the people who heard God tell them to “move to Africa”… most Christian’s worst fear, and they said, “YES”. Our long-term volunteers have “given up everything” to come and serve here and while this list is in no way exhaustive, I want you to think about it from your own perspective, what if it was YOU who was asked to move to Swaziland to serve the Lord at Project Canaan. · They miss seeing their own children, family, friends or co-workers whenever they want to. · They miss having their family present when their baby is being born. · They miss having their mom their to rock their newborn to sleep or feed him/her so that she can get some rest. · They miss favorite restaurants, movies and entertainment of almost any kind, whenever they choose. · They miss reliable electricity, internet and hot water, not to mention paved roads, fully stocked grocery stores, and International borders that don’t close. · They miss access to making a simple phone call to say hello to a friend, complain about a bad day or share good news. · They miss “normal” mail service to drop a card in the mail or send birthday wishes or condolences for a lost loved one. · They miss the seeing the latest episode of the favorite show, or real time sports games or the Stanley Cup playoffs. · They miss birthday parties, and anniversaries and graduations and Easter and Thanksgiving and Christmas and Mother’s Day and Father’s day. · They miss visiting their parents who are in a nursing home, or friends who are in hospital. · They miss attending funerals of children dying of childhood cancer or aged relatives slipping away in their sleep. · They miss sleeping in their own beds, in their own homes (without bars, electric fencing, a security guard and 44 little children in the same building). 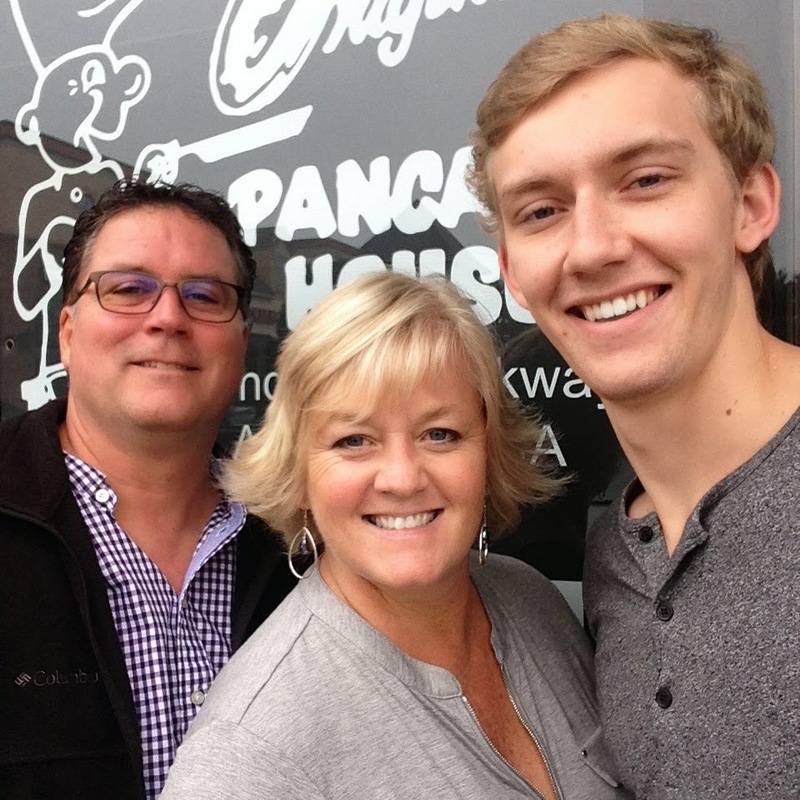 · They miss the “normal” part of a “normal North American life” including traffic jams, annoying co-workers, their home church on Sunday, dry cleaners and drive-thru restaurants. · Producing milk for the children who live at Project Canaan. 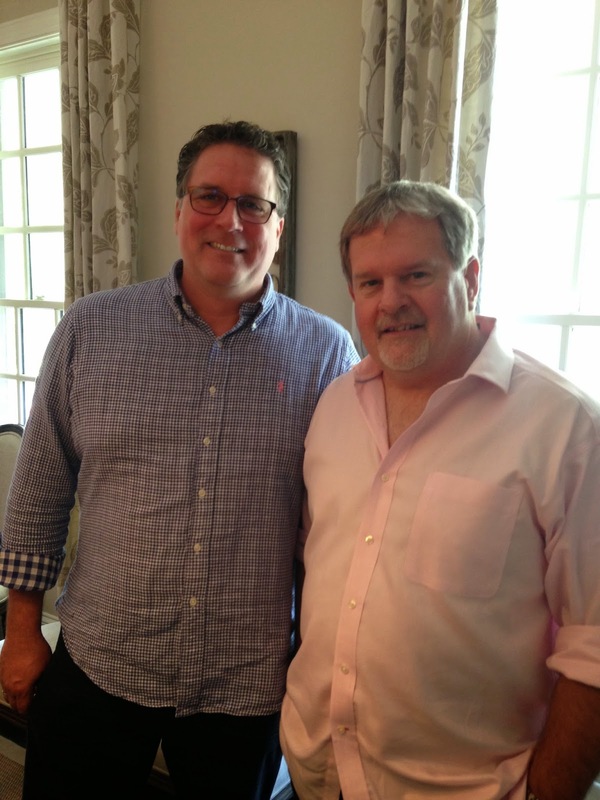 · Identifying and stopping the spread of diarrhea or ear infections to 90 other children. · Designing jewelry and training men and women to make it so that they can provide for their own families rather than begging in the streets for food. · Developing and teaching good farming and management practices that will help generate income to make Project Canaan self-sustainable. · Driving a baby to the emergency room to save his/her life, and then getting to pick that baby up again when he/she has been healed. · Making cheese to be sold in local grocery stores to help generate income and awareness of the work that is being done. · Teaching the once abandoned children who now live about Project Canaan about language, spelling, math, colors and texture as well as about love, giving, caring and the Word of God. · Constructing beautiful buildings that will last for generations and be home to hundreds of orphaned children that God is sending for safety at Project Canaan. · Sitting and rocking an Autistic child to calm his spirit and tell him he is loved. · Making sure that our accounting practices are excellent, current, accountable and beyond reproach. · Doing CPR on a dying baby in the backseat of a car, while your husband is rushing to the hospital with hopes of saving the child’s life. 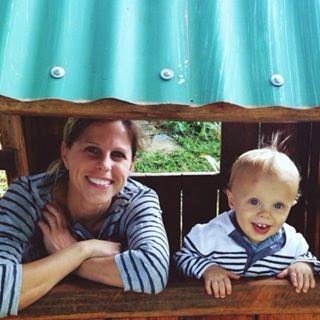 There are not enough words for me to list all of the things that our volunteers do here in Swaziland, or to fully explain their lives here, but Ian and I want to say “thank you” to each of you. Please know that we love you and are so incredibly proud of you and thankful for the sacrifices you have made to follow Him. May the Lord bless you abundantly for your obedience and continue to give you the desires of your hearts. Live from Swaziland … it’s Saturday night. Africa – Canada – United States – Africa … a journey of hope. This past month has been fun, long, hard, exciting, exhausting, rewarding, encouraging and filled with hope. I am always encouraged to meet people who say that they start their Saturday mornings with a cup of coffee and this blog. Many of those people also follow me on Facebook so when I write my weekly blog I try not to repeat what has already been posted. That being said, for those of you readers who don’t follow on Facebook, I want to be sure to give you a short update on some of our favorite, and important moments from our time in North America this past month. I will start by saying that Ian and my hearts are in Swaziland. The work that we do and roles that we fill are more than full time jobs and we spend 100% of our time focusing on all things “Project Canaan”, and we LOVE IT. So packing for 3 weather zones, to go on 12 flights and stay in 9 different hotels/rooms in 4 weeks is not really our idea of “fun” anymore. That being said, this month was amazing and here are just a few photos to give a glimpse of SOME of what we experienced. The highlight is always seeing our 20-year old son Spencer, and just hanging out and chatting with him. He is a remarkable young man, and so much fun to "chill" with. We had a fantastic 12-days with the Egg Farmers of Canada and Egg Farmers of Ontario as they officially launched their partnership with Heart for Africa and their commitment to build a Egg Farm on Project Canaan in 2015. 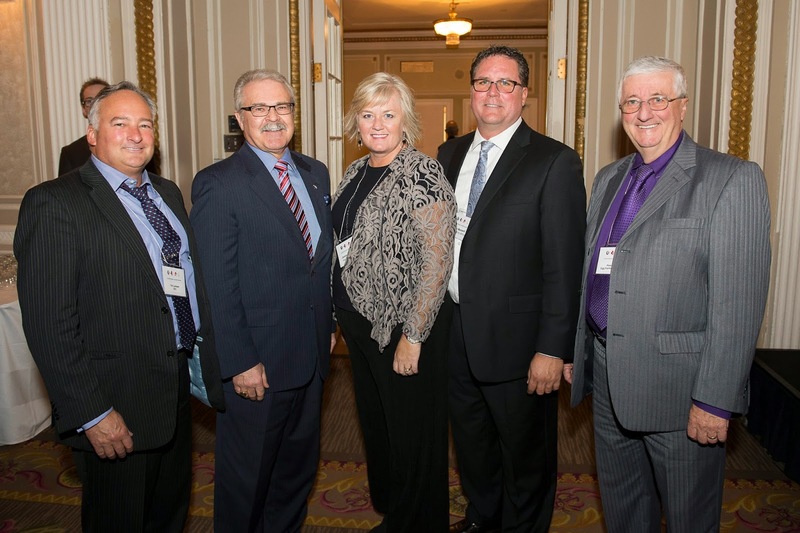 This photo is with the Canadian Minister of Agriculture. We got some great media exposure and the links below are two worth seeing/reading. We visited with Ian’s family in Ottawa and always enjoy seeing everyone and had the privilege of speaking at the West Ottawa Rotary Club to thank them for their participation in the funding of the Living Water Dam. We got to visit my 84-year old mom, who lives in a nursing home in Ontario and my cousin Kim who is my voice when I am not there. Each time I see her I am so thankful that my mom is the reason that I believe in Jesus and have followed His path, and I am equally aware that each visit might be our last. So thankful for my cousin Kim. We loved seeing old friends and work colleagues and enjoyed getting caught up with their lives and families. My besties... Dee Dee, Judy and Kathryn. 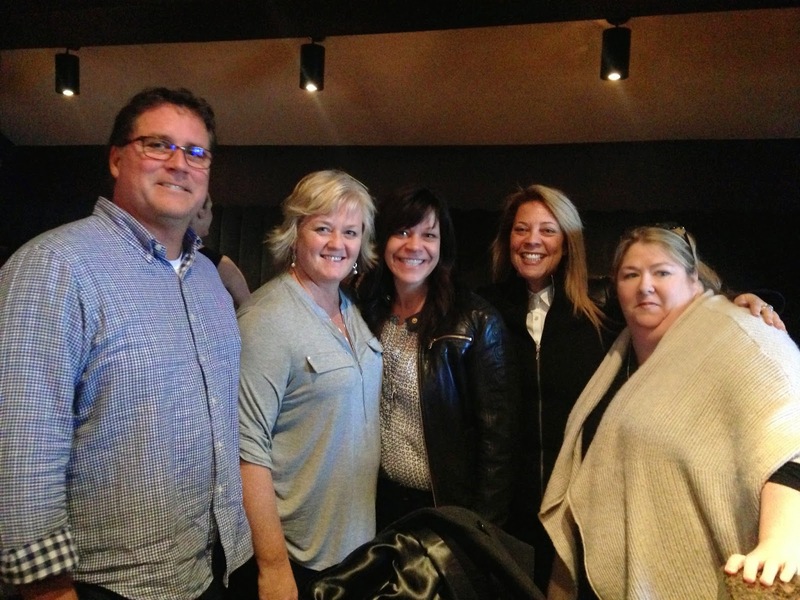 So awesome to see Charlene, Sally and Diane (with Carol Kirk taking the photo). It seemed that this month was 4-weeks of meeting for coffee, breakfast, lunch and dinner. Not ideal as we are trying to lose weight, but so much fun to meet new people and hear their stories. From Canada we went back to Georgia for more time with Spencer and got to have amazing burgers with Chad and Amy Gregory as they search Atlanta for the very best hamburger experience. 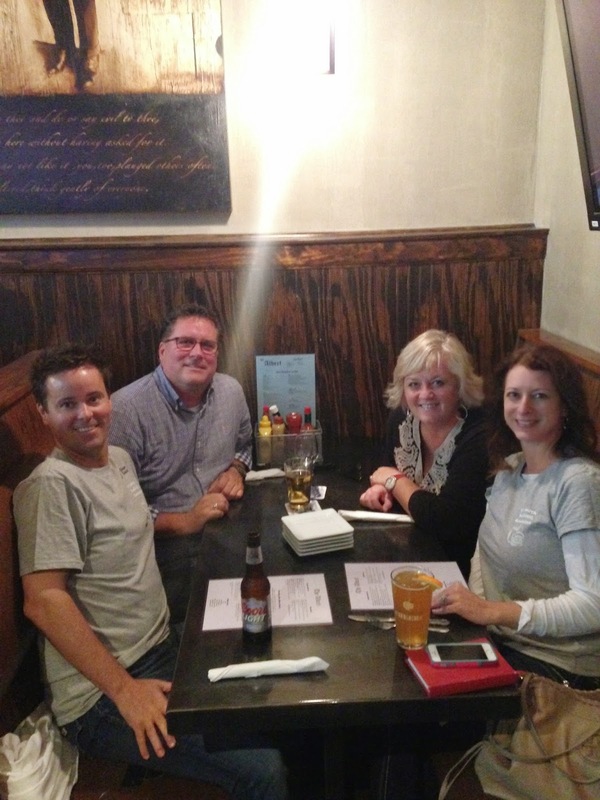 Our friends, Chad Gregory, CEO of the United Egg Producers, and his beautiful wife Amy. Welcome North Point/Waumba Land team! Welcome Marsh family who want to commit to do something "more". Thank you Kim and David for your hospitality and generosity. We enjoyed seeing all of our friends at the MedAssets annual conference in Las Vegas where we sold $4,800 in jewelry and recruited more people to volunteer with us in 2016. 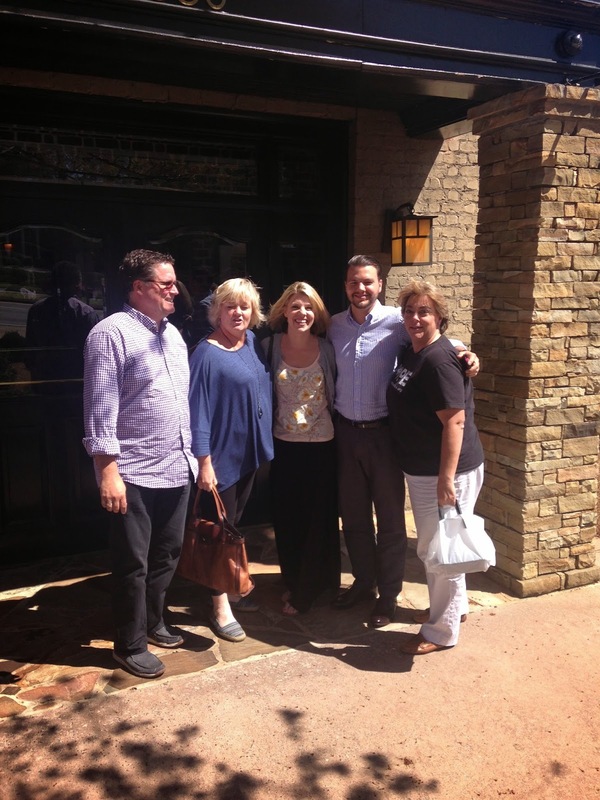 MedAssets conference with Board members, Sandra Green and Ned Lehman. The Grand Finale happened in Washington, DC, where we spent time visiting Senator John McCain and then attended a magical evening that our friends from UPS hosted in the beautiful UPS town house. The goal of that event was to raise funds for us to start our Hydroponic Greenhouse project to grow strawberries and tomatoes and this mighty team raised $47,000+ for the project! 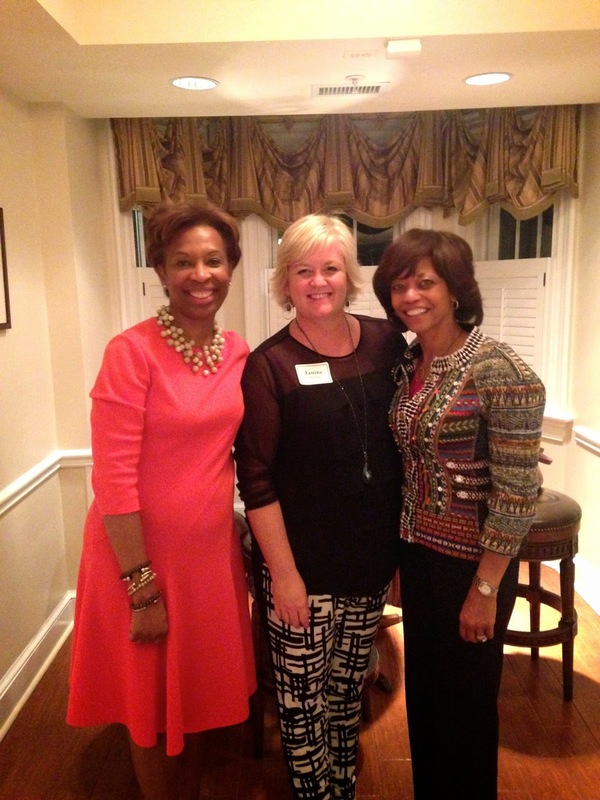 Such amazing friends - Janice Johnson and Teri McClure. Thursday night we got on a plane in DC, routed back through Atlanta and then flew on to Johannesburg. Today we woke up in South Africa and took one last flight to our beloved Swaziland. We are so thankful to all of our friends, family and supporters who give selflessly and sacrificially help us provide for the children at Project Canaan, and so many others around the country of Swaziland. We are thankful to be home and we are feeling hopeful. Live from Swaziland … it IS Saturday morning. Labels: Chad Gregory, Egg Farmers of Canada, Jerry Coffee, John McCain, MedAssets, Teri McClure, UPS. Food in Swaziland is simple. We eat very “clean” food (not that our weight reflects that in any visible way). We don’t eat fast food, food with preservatives and Ian and I love to cook at home together. But when you live abroad and plan to head back “home” the dreams and visions of past food loves start to dance in your head. When Ian and I landed in Canada, our first lunch stop was to get Poutine. What is Poutine you might ask? It is a delicacy from the French part of Canada and it consists of a bowl of French fries, delicately sprinkled with squeaky cheese curds, all covered with smoking hot beef gravy. Then you flavor it to your personal taste by adding white vinegar, ketchup and lots of fresh pepper. It’s divine, but you can almost feel your arteries closing while you consume it. Ian and I love watching The Food Network on Sunday afternoons, and a particular favorite is Guy Fiery’s “Diners Drive-Ins and Dives” (DDD). A few months ago we discovered that DDD has an APP for our phones, which we both purchased immediately. Now you might ask WHY we would do that when we don’t even live in the US, but you should check out the APP yourself and you will see why. You can follow the locations of the show, add locations to your personal “bucket list” or just search the APP while you are in a new city. Ian watched a particular show about a food establishment in Las Vegas called “Road Kill Grill” and immediately added it to his “bucket list”. Not only that, but he arranged for us to arrive in Las Vegas a day earlier than needed for the Med Assets conference, JUST so that we could go there. No word of a lie. A 30-minute taxi ride, with a driver who had never been to “that part of town” ended in an old suburban area that had to have been the very first houses ever built in Las Vegas. As we arrived it was clear that this was not at DINER, nor was it a DRIVE-IN … but it clearly qualified for the show, if you know what I mean. This place is a butchery, and they smoke and preserve meat, with the claim to fame of being the largest Deer meat processor in the southwest (pause). I won’t lie, if the taxi driver hadn’t driven off so quickly, and my husband hadn’t planned this visit for so many months, I think I would have headed back to the Vegas strip for a light lunch. But no, the scene was set, the actors in place and we entered the “establishment” with great expectations (I could use the words “hesitation” or “anticipation” here). We were not disappointed. 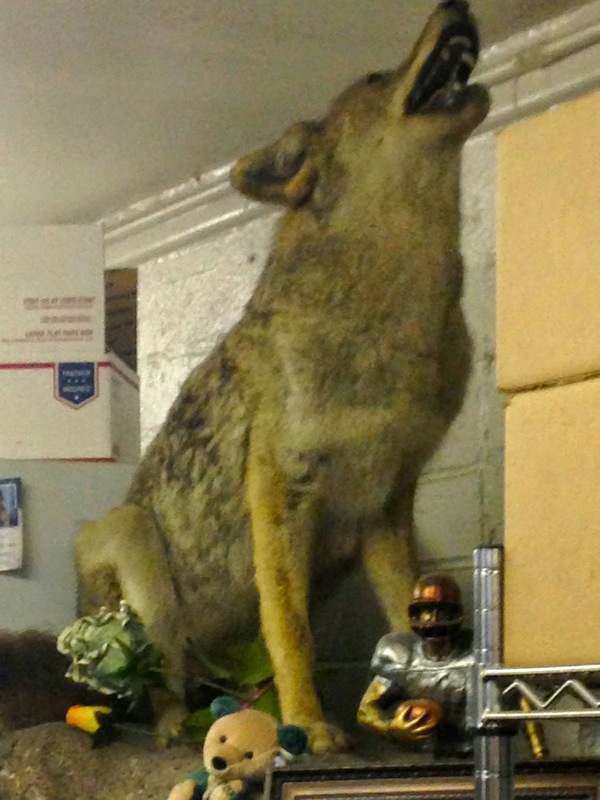 A large stuffed coyote was the main decoration in a very small cafeteria-style room with five main food items on the menu. You could order meat, meat or meat. 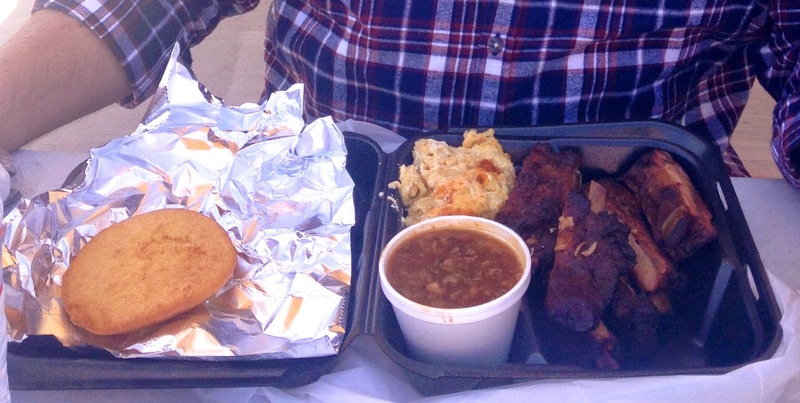 We chose meat … ribs to be exact. The food was good old-fashioned southern cooking complete with all the usual sides of mac’n cheese, potato salad, slaw, baked beans or over cooked green beans. The ribs were good and the BBQ sauce even better. The salt induced coma that I fell in to shortly after eating required me to not only have a two hour nap in the afternoon, but our stomach’s actually refused any thing further for the rest of the day, including dinner. We still have one more very busy week of fundraising and meetings ahead so Ian and I decided to make a “wise” decision last night and stay away from the big costume party/blow out that annually closes the MedAssets conference. Instead we decided to do a “tapas-hop” and try a few appetizers from a few new restaurants. 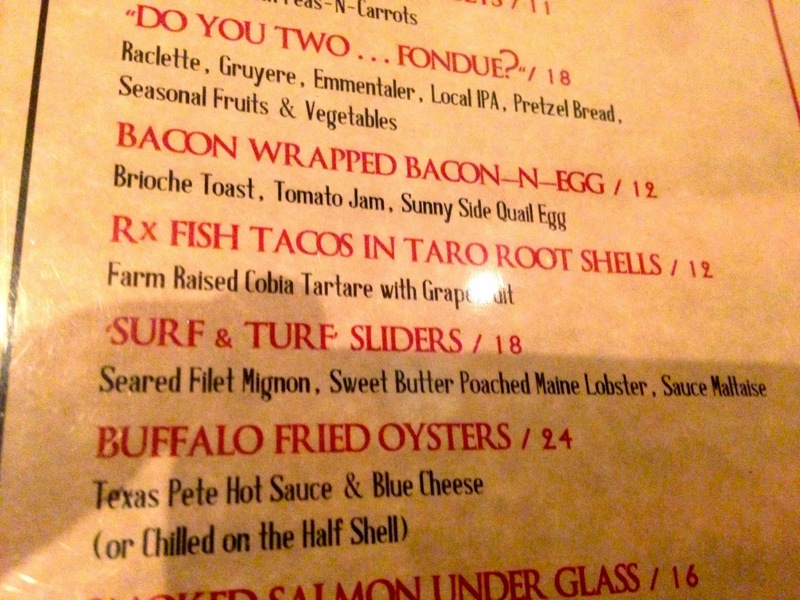 Our final “hop” landed us at a restaurant that is a MUST GO if you are ever in Las Vegas. 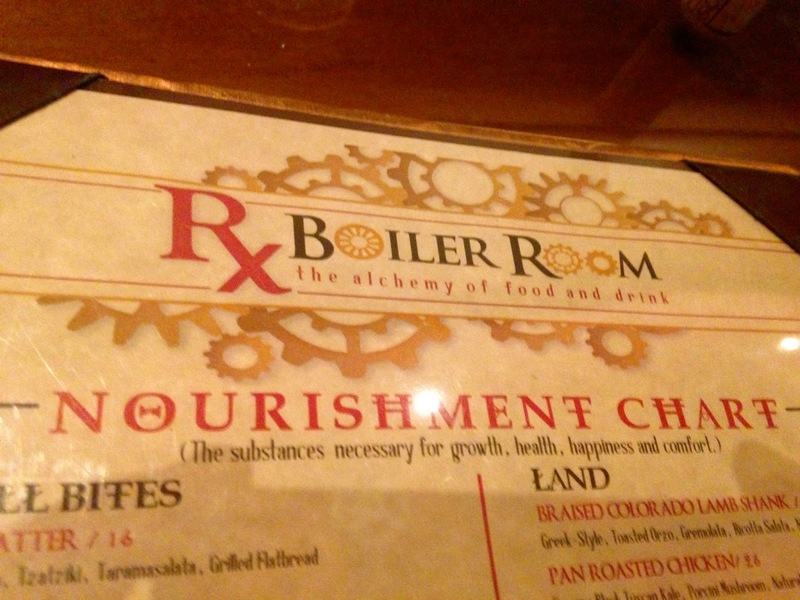 It is located at Mandalay Bay and is called Rx Boiler Room. It was there that we fell in love … with a slider. (For those who don’t know what a slider is, it’s a very small 2-bite size burger). 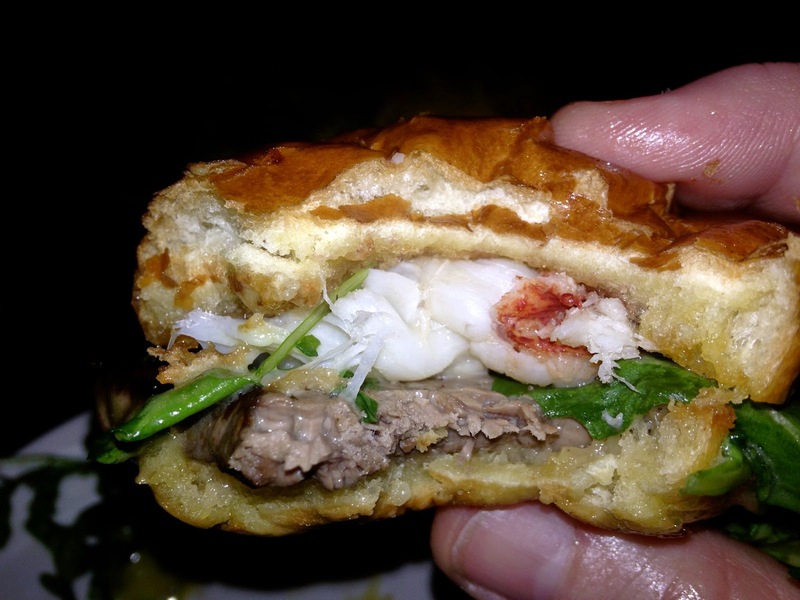 I was highly skeptical of the “Surf & Turf” slider that was described as “Filet Mignon, sweet butter poached Maine Lobster with Maltaise sauce”, but when we questioned the Waiter about it, he literally rolled his eyes with the look of love and said “you must try it”. And we did. And we fell in love with a slider. The rest of the menu was equally outstanding and the Meze platter of baba ganoush, tzatziki and taramosalata finished of our visit to Las Vegas (and helped redeem my memories of ribs that almost killed me). Whether it’s fresh green beans from Project Canaan, “fresh” Poutine in Canada, or famous ribs in Las Vegas, we love food. And we are thankful that we have access to good food and choice each and every day when so much of the world does not have such luxury. Live from Georgia … thankful to be able to eat meals with Spencer this weekend. Baby Shirley is home in Swaziland. Gogo Shirley is home in heaven. Baby Shirley at 6-months old after surgery. This blog is based on a eulogy that I wrote for Shirley Ward’s funeral on Thursday of this past week. It’s a story of incredible “coincidence”, or “fate” or “God’s plan” – depending on how you see things. I personally see the hand of God in this situation. A story of two people named Shirley, both of who were chosen by God to make a difference in the world. It is a story of hope from hopelessness and one that will be told for generations to come. The first person we will call “Gogo Shirley”. Gogo Shirley is our friend, our sister, our mother, our Grandmother and our Great Grandmother whom we celebrate this day. The second person we will call “Baby Shirley”. The very day that Gogo Shirley was taken to Durban, was the very day that a little baby girl was picked up at the Mawelawela Woman’s Prison and sent to live at the El Roi Baby Home. We named this little one “Baby Shirley” because she had just survived the fight of her life, and we wanted to give her a strong name and a namesake who was a Jesus-loving, God-fearing, prayer warrior. We named her after Gogo Shirley Ward. Gogo Shirley in July 2014 at the official opening of the El Rofi Medical Clinic. This little baby had a horrific start to life. Her young mother was filled with hopelessness and decided to dump her newborn baby in to a pit latrine after giving birth on September 10, 2014. Six hours later the mother went back to check on the baby only to find her still alive, so then she threw in fire on top of Baby Shirley to try to kill her. Someone heard the small baby’s cry and ran to her rescue, and because of that person, Baby Shirley lived. Baby Shirley at 6-weeks before surgery. 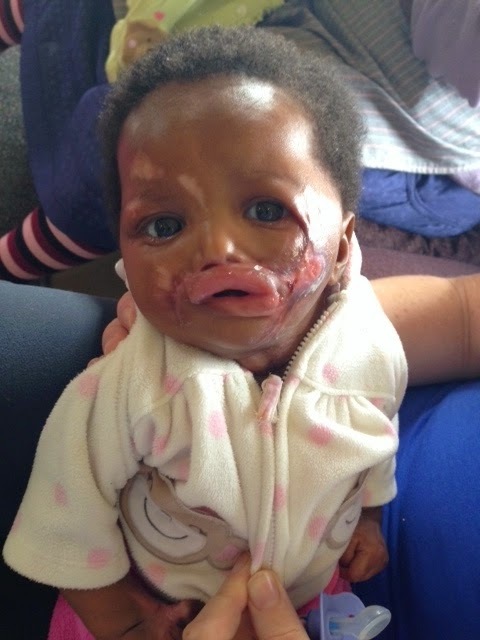 Baby Shirley’s injuries were extensive and she spent 6-weeks in a government hospital fighting for her life. When she came to the El Roi Baby home she struggled to breathe and ended up in hospital with pneumonia several times because food would go down in to her lungs. We know that Gogo Shirley prayed tirelessly for Baby Shirley, and the Lord heard her prayers. Baby Shirley was taken to the US for surgery and care. 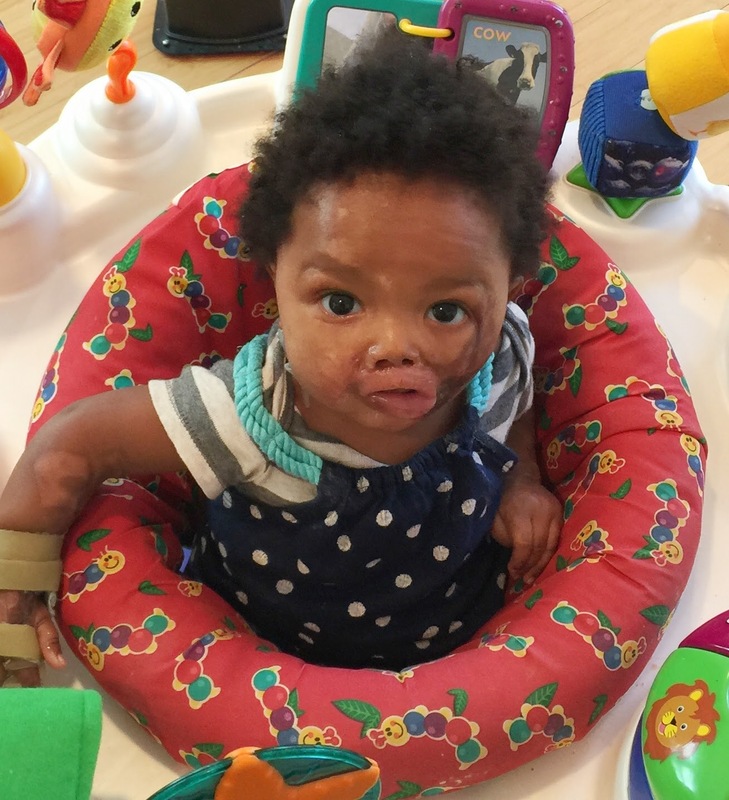 She is alive and well, and even thriving after her life-saving, life-giving surgery. Baby Shirley was being loved and cared for by complete strangers who claimed her as their own and worked diligently to save her life, while Gogo Shirley was being loved and cared for by her own family who did everything in their power to help extend her life. But God’s plans are not always our plans. It is He who gives life, and it is He who takes life away. He has numbered our days and it Is He who decides when we are to be taken home. And do you know what? 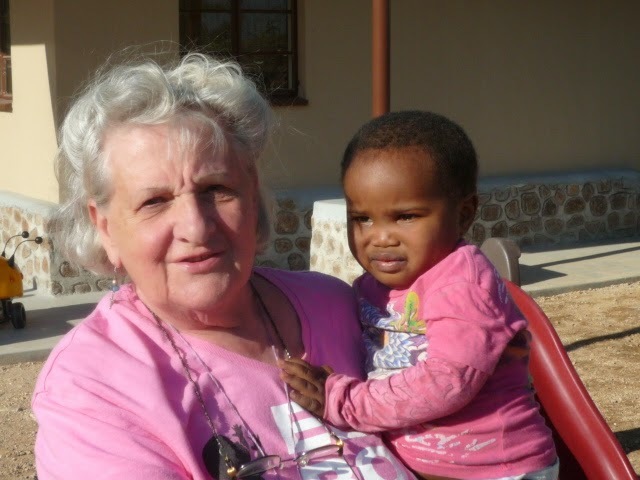 The very day that Gogo Shirley went “home” to be with the Lord was the very day that Baby Shirley came “home” to Swaziland to live at the EL Roi Baby home again. This story is one of so many stories that each of us could share about seeing the hand of God on Shirley Ward’s life. · It was Shirley who met with Cindy Van Wyk and told her we were looking to buy some land, which eventually became Project Canaan. · It was Shirley who sat for hours (or days) on end in government offices to try to determine the process for opening a home for abandoned babies. 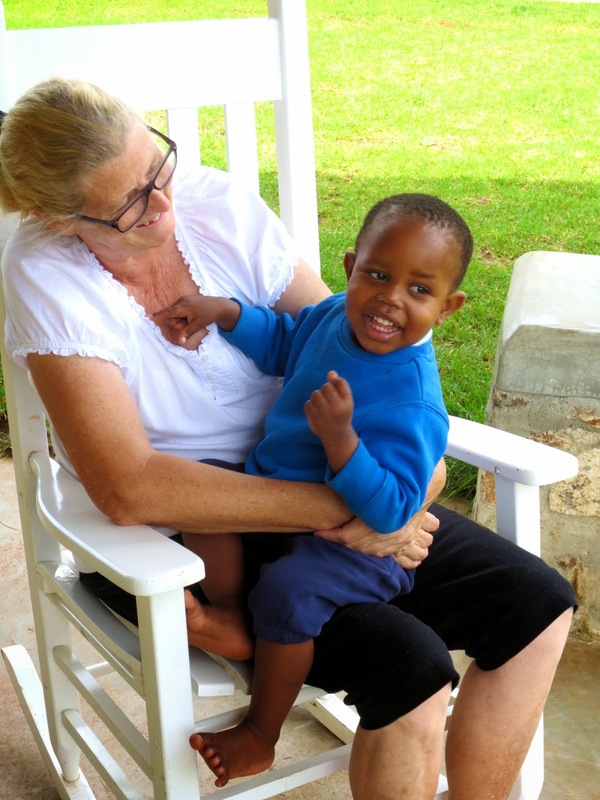 · It was Shirley who met the Social Welfare Officer who brought the first baby, Joshua, to the El Roi Baby home. · It was Shirley who answered phones, ran to the bank, anointed babies with oil, cried when babies died, cheered when babies were rescued, called the Inkhosikati when we needed help, met with government leaders and pastors to make sure that the orphans of the Kingdom were allowed to attend Litsemba. 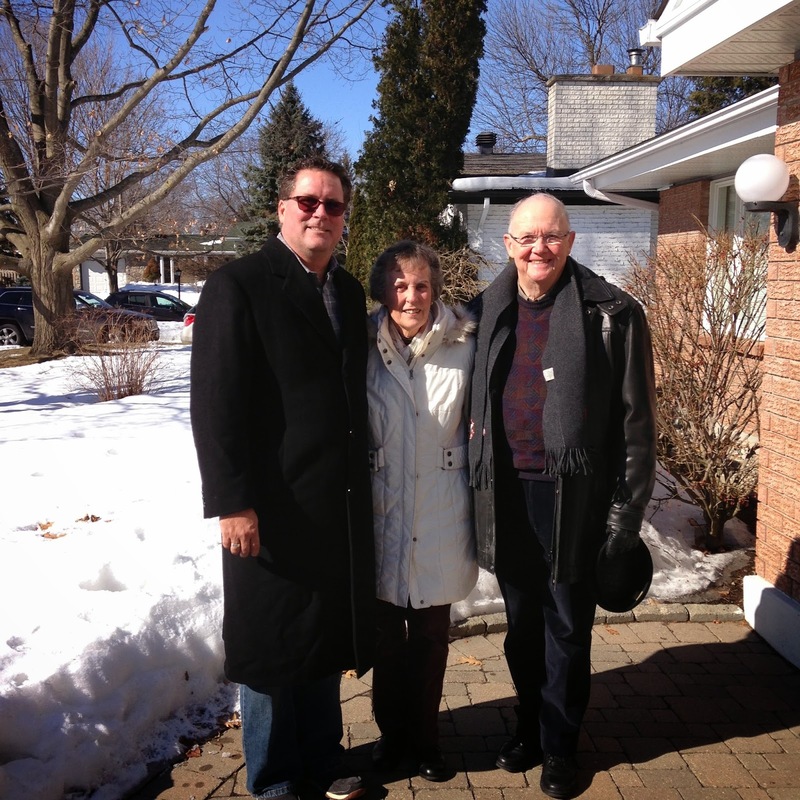 · It was Shirley delivered food to families in need and to our partner homes. Shirley reconciled accounts, handled accounting and paid bills. · Shirley was a mighty warrior with a sharp sword and an army of angels behind her. Shirley, you were a great friend, an incredible role model and have changed the face of Swaziland. You will be greatly missed. Your name will be known to all of the children at Project Canaan and your strength, your fortitude and your faith will remain with all who live in the city on the hill that you helped build. You finished well. Shirley’s family had a service in her honor on Thursday, and her ashes will be returned to Swaziland where she will be buried on Project Canaan when we arrive back at the end of April. Live from Georgia … He is risen indeed! Happy Easter everyone. Labels: Baby Shirley, Gogo Shirley.